Peter Weverka is the bestselling author of several For Dummies books, including PowerPoint 2007 All-in-One Desk Reference For Dummies and Microsoft Money For Dummies, as well as 30 other computer books about various topics. Peter’s humorous articles and stories — none related to computers, thankfully — have appeared in Harper’s, SPY, The Argonaut, and other magazines for grown-ups. Book I: Common Office Tools. Chapter 1: Office Nuts and Bolts. Chapter 2: Wrestling with the Text. Chapter 3: Speed Techniques Worth Knowing About. Chapter 4: Taking Advantage of the Proofing Tools. Chapter 5: Creating a Table. Chapter 6: Creating a Chart. Chapter 7: Making a SmartArt Diagram. Chapter 8: Drawing and Manipulating Lines, Shapes, and Other Objects. Chapter 1: Speed Techniques for Using Word. Chapter 2: Laying Out Text and Pages. Chapter 4: Desktop Publishing with Word. Chapter 5: Getting Word’s Help with Office Chores. Chapter 6: Tools for Reports and Scholarly Papers. Chapter 1: Getting Acquainted with Outlook. Chapter 2: Maintaining the Contacts Folder. Chapter 3: Handling Your E-Mail. Chapter 4: Managing Your Time and Schedule. Chapter 5: Tasks, Reminders, and Notes. Chapter 1: Getting Started in PowerPoint. Chapter 2: Fashioning a Look for Your Presentation. Chapter 3: Entering the Text. Chapter 4: Making Your Presentations Livelier. Chapter 5: Delivering a Presentation. Chapter 1: Up and Running with Excel. Chapter 2: Refining Your Worksheet. Chapter 3: Formulas and Functions for Crunching Numbers. Chapter 4: Making a Worksheet Easier to Read and Understand. Chapter 2: Building Your Database Tables. Chapter 3: Entering the Data. Chapter 4: Sorting, Querying, and Filtering for Data. Chapter 5: Presenting Data in a Report. Chapter 2: Refining a Publication. Chapter 3: Putting On the Finishing Touches. 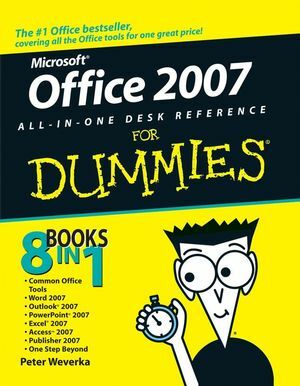 Book VIII: Office 2007 — One Step Beyond. Chapter 1: Customizing an Office Program. Chapter 2: Ways of Distributing Your Work. Chapter 4: Decorating Files with Clip Art. Chapter 5: Note Taking with OneNote. Chapter 6: Collaborating with SharePoint Services. Chapter 7: Automating Tasks with Macros. Chapter 8: Linking and Embedding in Compound Files.